I can’t say I’ve ever been to India (though Wes Anderson has me dying to go). Nor can I even say I’ve eaten at that many authentic Indian restaurants. But I have tried a curry or two in my day and I know what I like in one. This recipe is a mix of everything I love about curry all rolled into one pan. And what do I love most about curries? Veggies and coconut milk. Since I wanted to keep this vegetarian/vegan friendly, I served it over coconut quinoa for added protein and fiber. I have to say it was a lovely choice. It really marries the dish together well (but completely optional). The rest of the recipe is basically veggies of your choice and a special mix of spices. I went with broccoli, carrot, onion, snow peas and tomato, but you could go with just bell peppers and onion, potatoes, cauliflower, etc. – whatever you wish! As for the spices I kept it simple with curry powder and a pinch of cayenne. But you could also just add a dried red chili for a similar effect. Extra turmeric, cinnamon or cumin would also be lovely. The end result? A super simple, veggie-packed (vegan and GF-friendly) curry that will please a crowd. Even those on the fence about curries should try this recipe as it’s heavy on the coconut milk and light on the spices. I think you’re going to love it. 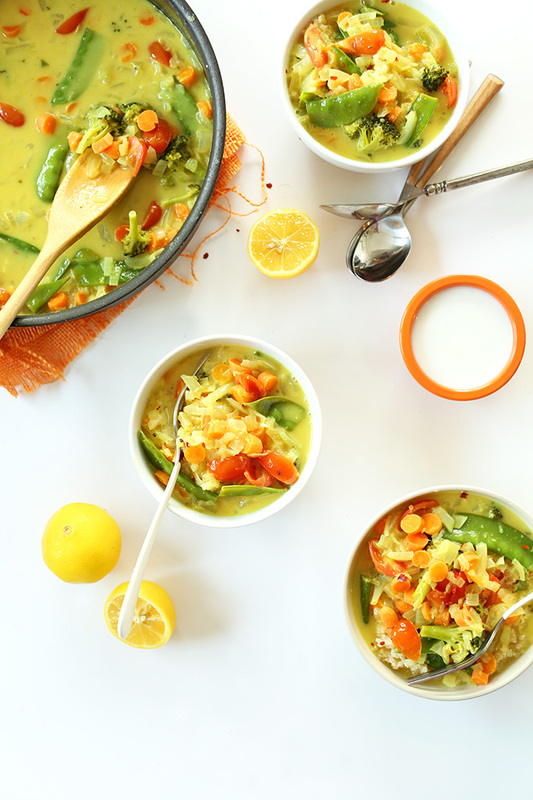 A vegan, gluten free 30-minute curry that’s loaded with veggies and swimming in a perfectly-spiced coconut milk broth. Coconut quinoa sends this over the top. Simple, healthy, fast and so delicious. If serving with coconut quinoa, begin by washing thoroughly in a fine mesh strainer. Add to a medium saucepan over medium heat and toast for 3 minutes. Add light coconut milk and 1/2 cup water (amount as original recipe is written // adjust if altering batch size). Bring to a boil, then reduce heat to simmer, cover and cook for 15 minutes or until the quinoa is light, fluffy and the liquid is absorbed. Set aside until serving. In the meantime, heat a large saucepan or pot to medium heat and add coconut oil. Add the onion, garlic, ginger, carrot, broccoli and a pinch each salt and pepper and stir. Cook, stirring frequently, until softened – about 5 minutes. Add curry powder, cayenne (or chili pepper), veggie stock, coconut milk, another healthy pinch of salt and stir. Bring to a simmer then reduce heat slightly and continue cooking for 10-15 minutes. Add the snow peas and tomatoes in the last 5 minutes so they don’t overcook. Taste and adjust seasonings as needed. I added another pinch or two of salt. Serve over coconut quinoa (see other options below in notes) and garnish with fresh lemon juice and herbs. * You can sub 1 tsp ground ginger per 1 Tbsp fresh. * You can sub 1 dried red chili, diced per 1 pinch cayenne. 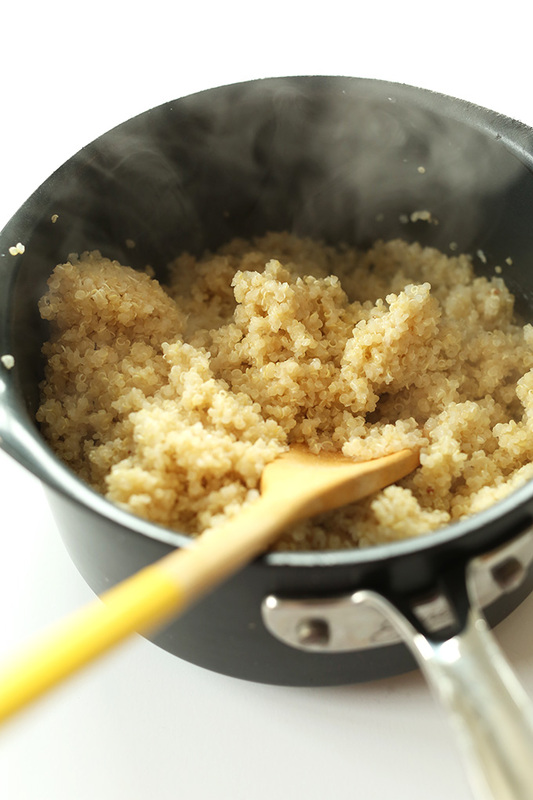 *An alternative to coconut quinoa would be plain quinoa, millet, coconut rice, or white or brown rice. I put the curry on a bed of lentils, put more ginger than called for (about double) and stocked it with double the veggies for my newly vegan daughter; the meal was divine! Another good idea would be to to sear it before hand after seasoning it with olive oil, salt, pepper and curry powder – and setting it aside. Then adding it with the rest of the sauteed veggies. The dish is delicious. I added more than double curry, plus cumin, garam masala, cinnamon, and turmeric. Plus I loaded up on the veggies. In addition I used red peppers, bok choy, bean sprouts, water chestnuts, baby corn, and snow peas. Definitely will make it again. Easy and quick other than cooking all the added veggies. I also finished it with cilantro, chopped peanuts, and Chile sauce. Do the calories include the quinoa also or are they just for the coconut curry? Yes it does! We hope you enjoy the recipe, Steph! Another simple, fast and delicious recipe. I loved the coconut + curry flavours, which I never use. I only use coconut with Thai-style curries, so this was really different. Smart! Glad you were able to use up your produce, Allison! Made this tonight and it was amazing! Instead of using quinoa I used Pad Thai rice noodles (the thin ones). I just added them to the curry. Kids loved it! My son says it’s his new favorite. We made this for a second time this afternoon and enjoyed it immensely. So easy and delicious. I like to add a ton of extra veggies to anything I make so I did that here too. Sauteed what I had on hand (cauliflower) with extra onion, red Thai chili, carrots, ginger and garlic then threw that on top of the original recipe mixture. I served it with rice noodles (again, what I had on hand). A real keeper! Thank you so much for sharing. Thank you, Dana! I’m wondering if I could add tofu to this, and if so where and how? Hello! I am making this recipe tonight and I want to add potatoes. How would you go about that? Would you add them with the vegetables in the beginning, add them when the curry sauce is put together and let them simmer, or boil them in water beforehand and then add to the curry? I added potatoes in the early stages and let them cook in the sauce. Works fab! Don’t be scared to use salt! A few pinches wasn’t enough for me. The fresh Hernandez are a MUST!!! I preferred the basil. I used full fat coconut milk and added mushrooms as I had no snow peas. Also next time time I’ll add more veggies as we had a surplus of sauce. Wonderful recipe. Thanks! I love this dish with homemade spicy rhubarb chutney. I learned this tasty addition from a “curry shack” at a folk festival in northern Alberta called the North Country Fair. Thanks for the recipe; it turned out to be amazing. I altered it slightly, using different vegetables and added extra seasonings. I also used fresh coconut and coconut water. It was a hit; I will make it again. I wanted something easy and quick, I boiled 1 1/2 cup of water with 1 ts of curry powder I wanted to add chopped fresh ginger but I forgot added 1 cup whole wheat couscous set it aside , one good thing about couscous it doesn’t required cooking whole wheat couscous with curry powder no broth or coconut milk I didn’t want this to rich. I used red peppers green beans carrots and onions . I used the full fat coconut milk I cubed tofu tossed it with tapioca starch and more curry powder pinch of salt and baked it in the oven until crispy when my curry was done I added my tofu that really made it super good . I could have used more curry powder in my sauce . It was better the next day the sauce thicken . Good start up recipe that you can use with any veggies and even lentils. Thanks for sharing your process, Brigitte! We’re glad you enjoyed it! I made this twice and the first time I thought it came out a little on the bland side. The second time I made it I doubled the curry powder and put 1/2 tsp of cayenne pepper to give it a little kick and it was a hit! Stumbled upon this recipe about 6 months ago and we have it AT LEAST once a week now. .. I also buy an over roasted chicken which my husband and teenage boys add to their servings. I have never ever commented on a blog- but we enjoy this recipe so much, I felt I was obligated to! Thank you- love your website. Woot woot! We’re so glad to hear you and your family enjoy this recipe regularly, Kim! Doesn’t look like we ever got confirmation whether it’s one or two cans of milk in JUST the curry. You say it two different ways in your responses. 2 cans in the curry and 1 can in the quinoa! Made this tonight. It was delicious. I used suggested veggies and added green pepper and a little extra curry powder. Served over brown (basmati) coconut rice with fresh cilantro, mint and red pepper flakes on top. Love, love loved it! Yuuum. This is so good! I change this recipe a little bit every time I make it to suit what I have on hand, and it always tastes amazing. I have omitted the ginger, and generally use frozen broccoli, but sometimes also add in some frozen cauliflower and green beans. I also fry up some tofu and add that in there. I haven’t tried the coconut quinoa, but that sounds delicious and is on my cooking to do list! I have made this probably over ten times now, and I can never get enough. Every time I make it, my housemates always comment on how the room smells so good! I only use one can and not as many vegetables because I only cook for myself, and even that is enough for leftovers. I also add a good amount of turmeric and some cumin to really make it more flavorful. It is seriously one of my favorite curries ever. I made it tonight, and it was delicious. I made the DIY vegetable broth yesterday in anticipation. But I felt like the amount of vegetables added was really small for the total amount of liquid. Next time I’ll probably add a lot more. Thanks! This was fantastic! I added tofu and turmeric, delish. On top of coconut rice made a perfect meal for the whole family. I will add, I had to boil it down a bit bc it was a little liquidey but next time I’ll just add EXTRA veggies to offset it (: thanks for the recipe. Will definitely make again! Really, really good. Thanks so much for sharing this recipe ! I made this for lunch and it was soooo good. I changed some things for what I had on hand but it was delish!!!!! AMAZING RECIPE!! I made this last night and it was a huge hit! I added in potatoes to it. The whole thing was delicious !! I made this for my 3 year old daughter and I for supper tonight and it smells amazing. We both loved it and she even ate seconds of it as well. I did add extra broccoli and I didn’t add any onions or the sugar snap peas as we hate them a lot. Love love love this recipe. We make this multiple times in a month, and the leftovers are even better than the night it’s made! We usually just put it over basmati rice, but the coconut quinoa is a real treat to go with it when we’re motivated to make it. It’s a great recipe to get rid of veggies that are just about expired, like potatoes or green beans. I made this about three times now, and it’s seriously one the best curries I’ve had! haven’t tried it over coconut quinoa yet, just white rice, but hopefully will in the future as I can see myself making this for a while. Thank you for sharing this delicious recipe!! Can I make this in advance and reheat it? I’m hosting a dinner party and want to make as much stuff in advance as I can. I have tried this recipe many times! It is so easy but so good…it is not a heavy curry so if you are looking for that this is not it but it is so light (yet delicious) and coconut dreamy. I serve it over brown rice that was cooked with half water and half coconut milk. Yummy! I changed some of the vegetables and made mine extra spicy. Great recipe, super fast and easy. Oh my gosh. I made this and it is the best vegan curry recipe I have ever tried. And it is so simple! I had avocado thrown on the side and the coolness of it matched well with the spicy coconut milk sauce. Well done with this one! I am fighting the urge to get more but….portion control! I am happy for those who enjoyed this curry. I, on the other hand was very disappointed. Watery, tasteless, took to long to prepare, and incomplete and vague directions. I tried this yesterday, I’m not very experienced in making curries so I was super surprised that this really turned out super delicious! I threw in some rice while the broccoli and carrots where cooking so it was a simple one pot dish. Made this tonight with sweet potato, peas, hard tofu and cashews. Added tumeric and small amount of chillies and used tin of coconut cream instead of coconut milk. Lovely flavours and colour. Will definitely make again. Delicious. Just made a moc version, as i have today coconut milk, onion, coconut oil, frozen veggies, fresh snap peas from the garden, and fresh swiss chard & curry powder. i approve, … husband says he won’t try it though (he doesn’t like curry or coconut), also made white rice. it takes a bit longer than this recipe but worth the wait! I made this tonight and I’m typing this as I eat it. A M A Z I N G recipe, maybe my new favourite dish to be honest. Oh my god!! Thanks for a fantastic recipe…this one is a regular at our house, and everyone loves it! It is delish with shrimp added in too! I usually just use one can of regular coconut milk, and it turns out great. We love it with jasmine rice. Thanks again! SO GOOD! I added a little extra chili powder, plus a dash of cumin, garam masala and turmeric. Turned out rich, slightly spicy and delicious. This is definitely going in my regular recipe rotation! Made this a few days ago and really enjoying it – for the veggies I used a tomato, a frozen veg mix of broccoli and cauliflower, and some kale as that is what I had on hand, and added in some cooked mung beans I had laying around (after this finished cooking). I also used regular milk in place of coconut milk to lower the fat content to tailor it to my nutritional needs. Love that you don’t need a zillion spices to make a delicious curry – this took just a few minutes as I actually tossed everything into my slow cooker instead of cooking it on my stovetop. Thank you, thank you :D this will definitely become a regular go-to for me. Oh my God! This was the best Curry I’ve ever had! Wow! The only things I did different was I made coconut rice because we’d had one lot of quinoa recently. For the vegetables I used broccoli, carrot, mushrooms, green beans and a couple potatoes. I also added chickpeas. I’ll be making this again and again! This is my second time making this recipe in one week!! So delicious. Is it possible to freeze this guy? Or should it be stored in the fridge and eaten within the first few days? I made this yesterday and loved it! I used a curry paste and added a few tablespoons to get a really good bite of the curry taste. I really liked the quinoa in place of rice. The first time it It wouldnt let me select more than one star!!! But I give it 5! This soup was amazing! I am trying to bring my whole family over the plant based diet and this soup I think was a game-changer. So delicious and something different and EASY! Awesome and I am DEFINITELY following you for more!!! I added in a few yellow potatoes and only used one can of full fat coconut milk and then the rest water (all I had). I just found this recipe tonight and made it. It looked terrific and smelled terrific. I used broccoli, snow peas, carrots, shitakes. It was not sweet at all. Am I the only fool who bought unsweetened coconut milk? The recipe didn’t specify so I thought I’d better get the unsweetened in the can. Thanks for the tip. Picky toddlers here. Dana, I’ve always wanted to but feared making curry. Thanks so much for such an easy and delicious recipe. I omitted the onions as they cause me acid reflux but the flavor did not lack. I used water as I had no broth and cleaned my fridge by using up a Half a carrot, bunches of baby spinach, kale, brocollini, yellow peppers, cauliflower. Delicious. I can see why you’d want more sauce. It costs the dry rice so well. I used leftover brown rice. Adaptable enough for me to add chicken for my non vegan hubby and still know he’s getting a healthier meal. You’re always the first site I check out when I’m looking for recipes. I made this tonight and did spice it up more and it was delicious! 2T curry powder, heavy shake of cumin and Ceylon cinnamon, hardy shake pepper, 1T raw organic sugar, and 1tsp salt…added some left over cauliflower along with the broccoli, multicolored carrots, onions, garlic, 1 can light coconut milk and 1 can whole coconut milk. Yummmmmmyyyyy? Enough left over for tomorrow night and maybe lunch on Tuesday, using 2 servings tonight! The agave nectar is mentioned as optional, when would I add this to the quinoa? Hi! Add it along with the coconut milk and water! Happy cooking! Just made this for the first time tonight and it was wonderful! I added cashews and chickpeas. Will definitely be making this again. Thank you for teaching me how to make coconut curry! ? Dipping my toe into a vegan lifestyle (currently veggie & coeliac!) made this last night and I thought I’d literally died. So so good. Any change the curry itself can be frozen? Anyone tried this? Just thinking I’d love to make a batch of this up for lunches! The good: a reasonably kid-friendly (i.e., very mildly seasoned), quick curry that can be adapted to vegan/vegetarian/omnivore palates. The bad: way too watery, dicing made the veggies too small, broccoli was mushy. I made it a second time with only one can of coconut milk (full fat), two teaspoons of curry powder, and 1/8 tsp of cayenne. Also, chopped most of the veggies, with the exception of the carrots (sliced). Much more like the restaurant curries I’m used to. Adding the broccoli towards the end with the peas and tomatoes helped avoid overcooking it. We added some leftover chopped rotisserie chicken, and I’ll try it again with shrimp. I bet tofu would work well, too. As someone else mentioned, I wouldn’t bother with the coconut quinoa – there’s enough coconut flavor in the sauce to pair it with regular quinoa or rice. Hi! Hmm it sounds like you may have overcooked your quinoa! Better luck next time though! Really tasty! I had rice on hand and made coconut rice vs. quinoa, so I added some chickpeas for protein. Great flavor! Great flavors! Next time I’m going to try address my cabbage! The Mrs. and I just made this tonight and WOW! Knocked our socks off. We omitted the chicken/veggie stock (too much liquid) and used S&B Oriental Curry (Best we’ve come across to date). This has now become our go-to recipe. Quick, easy, and healthy. That will make it very rich, but yes it will work! I LOVE this recipe, so I made it for a house full of meat and potato eaters, and they couldn’t believe “healthy food could taste so good”. Needless to say, there wasn’t a drop left. I do believe we have converted a few people to the vegetable side. ;) Thank you for creating such a simple and tasty recipe. Keep them coming!!! just made this! it was so easy and tasted amazing! thanks for posting this! I made this curry (with a few Paleo alterations) and your recipe is scrumptious. I added some slivered golden potatoes instead of the quinoa. Keep on sharing your fun flavors! I just made this recipe and it was delicious! Thank you! So is it three cans or not? I made the curry with two cans and it turned out too watery. two cans are for the curry, one is for the quinoa. So why did you tell one person that it’s one can for the curry and one can for the quinoa? Oh my goodness. This was amazing. I used pretty much the same vegetables as listed- except red pepper instead of tomato. The sweet and heat were well-balanced. I have plenty of leftovers for lunch tomorrow, but after reading the posts above, I might cook up some sweet potatoes to add to it for tomorrow! Made this recipe exactly how it’s written, turned out great!! Second time I made this (may or may not have been in the same week ?) I used plain cooked brown rice, added more curry powder and garlic. I liked it best with the brown rice (not cooked in coconut oil.) The sweet quinoa was a little much for me. The plain rice made it see a little more thick. Hi, can this be done in a crock pot? Can I use unsweetened coconut milk (SO delicious coconut milk)? You can try it! I usually prefer canned. I just recently switched to a vegan diet. I searched for vegan recipes that include broccoli as I got a bunch of organic broccoli on sale from a local market. I found your website. So glad I did! :0) I too am a curry lover. I’ve never made it though. Soooo gonna use this recipe and make some now. I also love me some coconut milk. I got some refrigerated organic coconut milk in a carton. Will that be okay for this recipe or is canned better? Both will work but canned is better! I made this recipe 2 days ago for the 2nd time in 2 weeks. I made it last week for my boyfriend who devoured it ALL after 2 helpings! Next to a soup his mom makes, he said this was the best homemade soup he’s ever had. I tweaked the recipe by adding more cayenne, cumin, crushed red pepper, and white pepper. I left out tomatoes and added cauliflower, broccoli, carrots, bell pepper and mushrooms. When I made it this week, I left out the mushrooms and added a diced potato and finished with about 2 cups of kale the last 5 minutes. I think this batch was even better than last week’s. I used two cans of coconut milk and it was nice and thick and creamy, not broth or runny. I also let it simmer for quite a bit, letting the flavors really sink in. This is an excellent recipe to build up and make it as spicy or chunky with veggies as you like. Thank you for sharing, this will remain in my recipe rotation! My first curry! Can’t believe it’s this easy, thank you for sharing this super yummy recipe!!! Also just read some comments on people finding it soupy, if you do the broth first, you can let it reduce get the flavor of the stock without the watery-ness. Just keep it on a simmer for about 20 min, if it boils it will overflow the pot so be wary. This is my go to curry recipe! It’s perfect! The only thing I do differently is make the “broth” first without the vegetables, just because I was over cooking them. I’m making this tonight but adding shiitake mushrooms… should be good! Also, has anyone tried freezing this? I’ve read pros and cons of freezing coconut milk, but would like to try it. I froze and actually took it to a festival with me and kept it frozen in a cooler for a week lol. I knew I couldn’t live without it though. It was still amazing when I heated it up, just expect that snow pea will probably come out of their shell. I love this for my vegetarian daughter, but it consistently turns out too soupy and looks nothing like the picture (veggies overwhelmed by coconut milk & veg stock). Any suggstions, anyone? Hi Jennifer! I would reduce the amount of veggie stock and/or coconut milk and play around with adding more vegetables if needed! I just made this dish with left over veg and is yummy. However it is very watery. Have I done something wrong? Hi Joei! Feel free to cut back on the vegetable broth or coconut milk next time if you prefer it thicker! This was insanely delicious and the curry tastes very similar to a coconut soup we get at one of our favorite Thai restaurants. I didn’t follow the recipe exactly because I didn’t have the same vegetables but it was good nonetheless. The flavor combination is amazing and it IS warm and comforting, perfectly sweet and has just enough heat to keep things interesting! Love, love, love. So easy to make. Gorgeous too. Oh I love this dish, made it for my carnivore boyfriend and he loved it! So so good! Gonna attempt next time over cauliflower rice to try to attempt less carbs but I love the quinoa. Dana u make amazing food! This is just the kind of curry I was looking for; heavy on coconut and curry flavors and on the mild side. I doubled the recipe but used 3 cans of coconut milk – two light, one not – and served it with jasmine rice. It was a hit with everyone. Would it be possible to make this in a crockpot? Also can I add veggies such as zucchini? Potato? I haven’t tried that, but if you do let me know how it goes! Never made my own curry before but looked and found this recipe. Will coconut cream work the same as I don’t have coconut milk. This is the first of many recipes I’ve tried from this site. I am head over heels for this site….and this recipe is my number one faaave!! I don’t typically like coconut anything, but I’ve found a love for that velvety, curry sauce at an Indian restaurante once, and decided to try it myself at home. The flavor of this recipe not only matches, but surpasses that wonderful taste of Coconut Curry. I like playing around with different veggies and even making cauliflower rice to put it on. Excellent Dish. 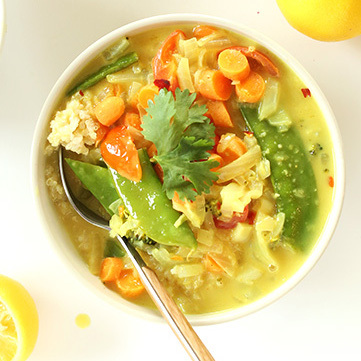 I will probably double the amount of veggies in this recipe next time as they don’t add very many calories and the “soupy” nature of this curry could hold up to more vegetables. My 18 yr old daughter had 7 girlfriends over to make a meal, mostly omnis. Daughter chose this one. Was a huge success! Yay for vegan and gluten-free! ? Wow, this recipe is incredible! I’ll take this one with me to the grave. We absolutely loved it! We are huge fans of minimalist baker, we cook your delicious recipes all the time! Dana! This was truly wonderful. I have been craving a simple curry for so long. Thank you for your easy, vegan meals. You make cooking a compete joy! My boyfriend and I made this last night and it was AMAZING! We added more garlic, curry powder and a bunch more cayenne. The veggies we used were broccoli, carrots, onion and bell pepper. I see some people say it was bland, but I believe it’s supposed to be a very mild curry. I also think the point is to adjust it per your personal tastes, considering what flavour people like in a curry (mild, medium, hot, sweet, salty) is so different. But the base recipe here is so easy and simply perfect! I have never cooked quinoa in coconut milk before and thought it would be too sweet, but it wasn’t at all. It added a nice, very mild flavour to it, and tasted great. We will definitely be making this again- YUM! This is suuuuper mild. It was a good base for many additions to make it a stronger, more intense curry.I added three times the amount of curry and some extra cumin and I was happy with it. I doubled the amount of vegetables, too. Next time I’ll use a bit less coconut milk and I think I’ll omit the tomatoes. I’ve come back to this time and time again for every reason under the sun – lots of family to feed, cooking for my partner who is vegan, meal prep for the week, comfort food. Honestly one of my favourite recipes each and every time. Hey Dana! I made this tonight for my boyfriend and me, and it was simply amaaaaaazzzzing! You are so good at creating recipes. Thank you so much! This recipe is a keeper and soooo delicious! I was looking for a delicious vegetarian entree that would also satisfy meat esters. I had a dinner party that included 3 vegetarians and 3 carnivores. I doubled this recipe. I did not add cayenne or chili flakes because 3 of the guests don’t like heat. Everyone raved over this dish and I was asked for the recipe! This turned out soo good!! I didnt follow it exactly and I added chickpeas. I also had it with plain bulgar wheat as I hate quinoi. Thanks for such an easy and tasty recipe! Is this recipe printed correctly? 5 cups of liquid in the sauce and less than 2 cups of vegetables do not make a “veggie-packed” curry. Way too much liquid for the quinoa and not near enough seasoning to make it taste anything like curry. I’m not sure what I did wrong, but this is not a very good recipe. I loved this recipe! I enjoy my curry with a bigger flavor punch so I added more garlic and curry and then threw a couple tablespoons of soy sauce in it. It was delicious. Two cans of coconut milk made quite a bit for just me and my wife so next time I will use just one. Love your page though! I have yet to find a recipe I dislike. I thought this is a lovely template for a clean out the fridge meal! I added a minced fresh chili & a Tbl of turmeric snap peas, asparagus & cauliflower in order of cooking times & I agree w/another reviewer on adding the broccoli w/the peas-I laid a big handful of fresh baby spinach on top when it finished up & covered…and I plan on reheating w/cubed tofu added. A note about picky/negative reviews~I’ll never understand that need unless something is way off in baking recipes. Thank you for this! Made this last night and it was so delicious! Improvised with what veggies I had and turned out super well. MMmmmM!! This was a lovely recipe! One issue though – my prep time was much longer than 5 minutes and I’m a fast chopper :) Does your recipe assume everything is already minced, chopped, and prepped *before* starting the prep time? That being said, it was delicious! This was delicious. I used broccoli, red pepper and snow peas and added leftover crispy tofu at the end. I added additional ginger and curry to our taste. The whole family loved it! I did the recipe with coucous instead of quinoa and it was amazing. I really love how easy it was. This is absolutely amazing! I added mushrooms and used larger portions of the vegetables. I just kind of eye balled it and went with the mentality that you cant really mess it up. Others were asking: I used two 13.5 oz cans of coconut milk and served over a power grain blend. it was just the perfect consistency. My meat loving husband requested this again and added “it would be excellent with some chicken”, so next time I will either bake or saute a chicken breast to add for him. Very easy -I cannot tell you how beautiful this dish was with all the bright colors when it was cooking! Delicious!! Only used 1 can of coconut milk and subbed in the veggies we had in the house. Asparagus, cauliflower, carrots and spinach. Came out great! I’ve been following you for some time now and I make one of your recipes at least once a week – granola, chia pudding, etc. I most recently made the Crispy Peanut Tofu with Cauliflower Rice and today I made this one, and my husband went for seconds. I used full fat coconut milk for the curry and it was so smooth and velvety. Just perfect like everything else you make. Thanks for sharing all these wonderful recipes. Loved this recipe! I added more veggies because I thought the sauce to veggie ratio was off. Otherwise, followed the recipe exactly as shown although I served it with regular quinoa cooked in veggie broth. I used full fat coconut milk and was very pleased. Enough for about 4 servings! This is so delicious! Really simple, easy and amazingly tasty dish. Thank you!! So yummy! For my veggies I used: potato, celery, frozen peas. I wish I had cayenne, or red pepper flakes, to give it a kick! Super delicious without the heat, though. You’re my favorite Food Blogger Dana! This is incredible! You won’t miss having meat. At all. And I love how you can use whatever vegetables. Soooooooooo yummy. Thank you for posting this!! Hi! Can I add tofu to this?? Mahalo (thank you) from Hawaii! This was very easy to make. Mine didn’t turn out that flavorful. Do you have any suggestions? Should I add more curry power? I love this as a starter for whatever veggies you have that need to be used. The first time I made it was a little bland, but adding more salt, cumin, lime juice and cilantro made it taste more intense, like what we get at a restaurant. Last night I used carrots, broccoli, and cauliflower. I can’t wait to try the veggies originally recommended. This was so simple and forgiving. Delicious too! I used what I had in the fridge…bell pepper, lots of broccoli, zucchini, sriracha (and chicken…shame on me!) Will make this over and over again. As a gluten free dairy free household, we can’t get enough of your recipes. Keep them coming! Hi, it seems delicious. But I’M cutting industialized foods. Can you give me a recepie of a veggie stock? You can find lots of good easy recipes on line to make your own vegetable broth- it’s especially easy if you use a slow cooker. I’m actually going to use my own veggie stock to make this tonight! All I do is save the veggie scraps I don’t use ( veggie ends I would usually throw away, greens on leeks and beets, kale stems, etc.) in a large freezer bag. I keep this in the freezer until it’s full. Then, I throw it all in a large pot, cover with water and bring to a boil. Let it simmer for an hour or so- take it off get heat and let cool. Drain it and throw away the veggies. Excellent. Easy. Endless vegetable variables! And…..I made a few modifications. I didn’t use tomato and I added mushrooms, celery, zucchini, and tofu. 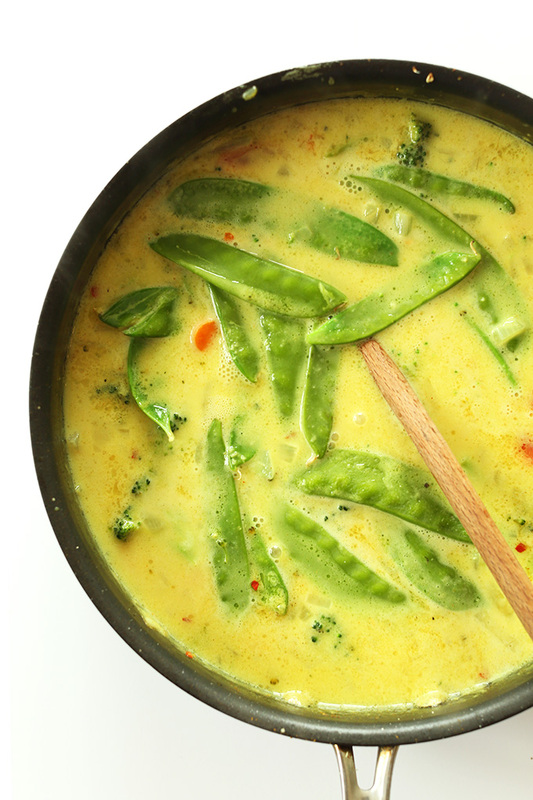 I think it’s the snow peas, broccoli, curry consistency, lemon, cilantro/basil/or mint topping that makes it more of a Thai dish than Indian dish. So yummy! Thanks for sharing this. Delicious recipe. Very flavorful and tasty. To me, it taste more like a Thai dish than an Indian dish. I have had similar dishes at Thai restaurants, but not anything like this at an Indian restaurant. I loved the recipe and we will be making it again. Thank you. I am a vegan but my kids/hubby are omnivores, could I just throw shrimp into this after I’ve served myself to make this a family meal? Or would those flavors conflict? I think that would work lovely, actually. Or chicken! Just saute beforehand, then add to the mixture. I made it and it is delicious. Unfortunately I had only 1 can of coconut milk and the rest I substituted with water + shredded coconut, but it was still very delicioussss. Just made this today and it is SO GOOD! I added a lot more chili powder bc I like it spicy,but the flavors here are top notch. I could just sip a bowl of this broth. YUMMY! This was really bland. I added extra ginger, curry, black pepper, cayenne, lots more salt; but what really saved this recipe was a drizzle of raw honey mixed in. (We used half lite and half regular coconut milk, and served it over spaghetti squash). 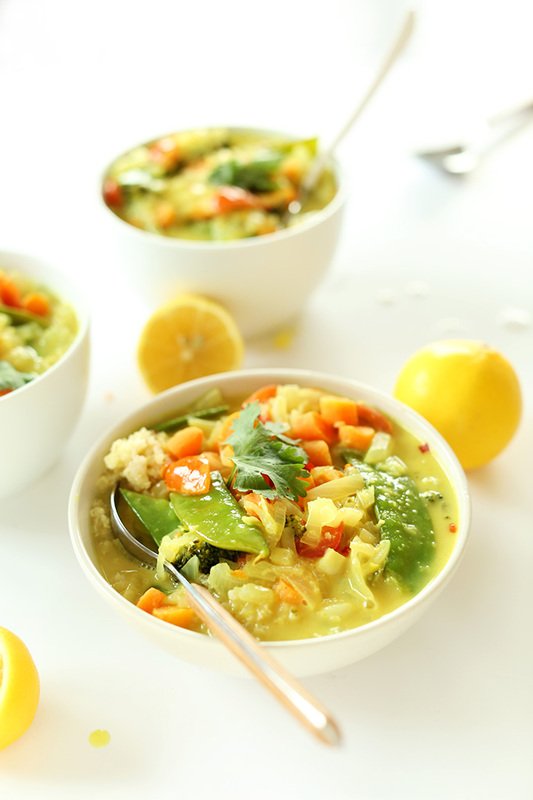 My toddlers loved the souped-up recipe, and I love how many veggies they ate! Definitely a win! I tried this out two nights ago and absolutely loved it! I was cooking for my parents (who love meat) so there was a lot of pressure to make something delicious. Obviously, I turned to your recipes, Dana because I haven’t found a bad one yet! I did make a few changes. I put half the amount of curry powder and half the amount of ginger powder because they are extremely strong spices and I like more of a subtle taste. I also added about 2 tablespoons of coconut sugar because I like my curry more on the sweeter side. After I put the sugar in, DELICIOUS! My parents enjoyed it as well– I even got my dad’s approval which is amazing because he’s an avid meat eater. For next time, I probably will just make regular quinoa. I couldn’t really tasted the coconut milk in it and I found that you don’t need it because the curry is already amazing on it’s own! Thank you for another great recipe. This was superb. I sprinkled a little cinnamon on the finished product. Yummy. Plated it over jasmine rice. I was looking for a tasty vegetarian meal without tofu and found it! I doubled the ginger, doubled the curry powder, and all but licked my plate clean! My 11-year old daughter said it had too much sweet spice and not enough heat, so next time I will likely try 2 1/2 tbsp curry (or a different curry blend) and add more hot pepper. I can see us playing with lots of variations of this recipe! Frozen veggies work in a pinch. This curry was so yummy! I added the juice of one lime, 1 tsp-ish of agave nectar, and toasted cashews to the curry and it turned out great! I love the amount of liquid in this recipe too, as I like my curry on the saucy side. The coconut quinoa is SO good. Toasting the quinoa before adding the liquid makes such a big difference too. And there are plenty of leftovers! I’m definitely excited to make this recipe again. Made this today by swapping out a few ingredients for my favorites, as Dana suggested. It was delicious and easy — especially welcomed because it’s light on the spice for my spice-sensitive spouse! FWIW, I used small chunks of sweet potatoes, red bell peppers, cubed tofu, and broccoli. If I make this again, I’ll not use the broccoli, or I’ll insert it at the last possible moment. It got super mushy by the time the 15 minutes of cooking were over, and that was the only bummer about this dish. Great recipe, though! I don’t know what the rave for this recipe is about. It was mediochre at best, and I didn’t find that it had a huge curry flavor (and i put two times the amount if curry). I followed the directions to a T. and i’m just not getting that lucious flavor that I crave when i go to an indian restaurant. I just feel like it’s missing something, and I can’t figure out what it is. This is a pretty straight forward curry, and if you’re looking for more intense flavors like salt, spice, tang, etc., feel free to increase the salt, curry powder, lime juice as needed! I noticed the same thing. While it is good, I found that it was a little bland and am not sure if perhaps I didn’t salt enough. I love curries, both Thai and Indian but can never seem to get a strong flavor profile. Mine had some spice and I could taste ginger, but other than that it was all coconut milk. Is that how the recipe is intended to come out or am I doing something wrong? Thanks! Feel free to up any of the spices in this recipe if you’re looking for a particular pronounced flavor profile! We love this recipe for a basic, easy curry that we find delicious and comforting, but maybe you’re looking for something different? Have you tried our Kale Sweet Potato Curry or our Coconut Red Curry with Chickpeas? You are blaming the recipe for not adapting it to personal taste? It was described to be “not too spicy,” and, “perfectly sweet.” So what exactly WERE your expectations? Also, the next time you want to slam someone else’s recipe as “mediocre, ” please learn how to spell it first. wow looks like someone has a little too much time on their hands. I didn’t slam the recipe, i was simply stating that it wasn’t what i expected and the minimalist baker replied to me MONTHS ago on how i could improve it…. so thanks for your input but no thanks. Indian curry is very different from Thai curry. I love them both, but Thai curry paste and Indian curry powered are different and cannot be used interchangeably. I just made this and holy sh*t THIS IS SO SO GOOD. I made some substitutions/added random things because I needed to use them up so here they are just in case anyone wants to know! I used 1 can full fat coconut milk with 1 cup regular carton unsweetened coconut milk because I didn’t have another can, added probably 1-3 TBS of agave, added 4 basil leaves and 1 tsp ground basil, cooked chopped baby carrots and potato before adding them in last, added some frozen peas, cauliflower and broccoli mix, and 1 chopped bell pepper. This is the first time I’ve ever made curry and omg never buying curry cubes again !!! THANK YOUUU YOUR BLOG IS MY FAVORITE. I see at least one person has asked how big the cans of coconut milk you use, and one poster used one can only. We found two cans made a dilute soup: these were Whole Foods 13.5 oz. I note that more veggies can be added easily plus quinoa. Just made this recipe for our family of four – and it was DELICIOUS! We will definitely be making again! This was delicious! I even added some mushrooms for fun. I cooked for a friend who is vegan and GF. She thought it was amazing as well. Thank you for this simple and fabulous recipe! How would we cook the coconut rice? We are at it again with this wonderful recipe. We made a curry that was almost the same as yours – no tomatoes and a little bit of tamari – and it just wasn’t as good as yours. This is just our hands down favorite curry. Really enjoy the basil and cilantro you recommended over top to serve. And the diced tomatoes give it some kind of magical flavor that other curries don’t have. We definitely up the veg quantity and type (red pepper, zucchini, reg. green peas in addition to listed veg) and only do one can of milk to 1 1/2 cups of broth with amt. of curry powder you suggest. We decided we like the full fat better because with the lite we just end up adding more to get the creaminess and it doesn’t taste as rich. We make this about once a week…at least! Thanks! What a beautiful curry! Thanks for sharing, Dana! Excellent! I’ve been making a similar curry for years but decided to try a new one, and this is my new favorite. Spicy, so flavorful, and my boyfriend loved it too. I used some different veggies – 1/2 a kabocha squash (which added to the lovely color), carrots, and broccoli. I added 1/4 tsp of garam masala, 1/2 tsp turmeric, and red pepper flakes because I didn’t have cayenne. Then cilantro and lime for garnish. And I only used one can of coconut milk and it was perfect! Goes so wonderfully with quinoa. If I wanted more protein I would cook some lentils on the side. Can’t wait to explore more recipes on here! So glad you liked it! Thanks for sharing, Lillian! I agree with the others that this curry, although delicious and very simple to make, is on the runny side! I see that one other person asked what size coconut milk cans you were using, but there was no reply. I only used one – not two – standard 400ml/13.5 fl oz can of full fat coconut milk and put more veggies in it than the recipe called for, and it was about right like that. As far as quinoa goes – that is an absolute hit! Helpful tip: I find it much much easier to cook quinoa by steaming it in a rice steamer. Absolutely perfect and fluffy every time with zero effort! loved this meal as a teenage vegan sometimes cooking can be tough and very time consuming but this was so easy and effortless. Made this tonight…as noted by an earlier comment, I too used only 1 can of coconut milk in the sauce. Very tasty! Really good recipe. Simple and delicious :) I added a bit more veggies and used coconut cream (so i also added a bit more water) and it turned out great! Thanks! This recipe looks so delicious! I’m planning on making it this weekend. I’m thinking about adding red lentils to the coconut milk/veggie mixture for a bit of added protein. Would you recommend adding more coconut milk or another liquid to accommodate for that? I would, yes, otherwise the lentils may not cook all the way. Fantastic recipe! Delicious beyond delicious and even my two year old wolfed it down! Only caution is that 5 min prep time is a huge underestimate. You have to dice everything. Plan on at least 20 mins. I’ve had some amazing curries in Thailand! This recipe right here came out just as good if not even better than some I’ve had in the past. I opt out for the vegetable stock since I forgot to buy it. I also couldn’t find snow peas so added edamame beans instead and I loved how it turned out. Just made this tonight! Sooo delicious. I added in red peppers, chicken, and the boyfriend doesn’t like quinoa so we just had it over white rice. I also wound up using chicken bullion instead of vegetable because it’s what I had on hand, and I added more curry powder than the recipe called for. Seriously I can’t emphasize how good this was, it’s absolutely going to become a regular in my recipe rotation! So easy and flavorful. Delicious! I made it last night for my boyfriend and me – we loved it and couldn’t stop going back for more! We are having friends over for dinner tonight, and he requested that I make it again. I swear I could eat this for days!! This dish was great! I modified it slightly but my husband and I enjoyed it so much. I’ve had this notion that curry involves a lot of ingredients (maybe from scratch?) so was always daunted in making it but this recipe was the bomb! We used half a can less of lite coconut milk, simmered the ingredients more aggressively and also added a lot of red chili flakes (the only topping we used). I love all your recipes and decided to bite the bullet and make this my first ever curry. Pleasantly surprised and a more than a little relieved to say it was delicious. I served it over red quinoa, but next time I will include the coconut quinoa, baby steps! Thank you for sharing! I just followed this recipe to the letter (well–I omitted the 1/4 cup diced tomatoes) and it smells and tastes delicious—–but am I missing something? Because there are virtually no veggies in my pot; it’s all broth! Maybe the recipe formatting has changed recently and the ingredients list is supposed to call for 1 1/2 cups broccoli, 1 1/2 cups carrots, and 1 1/3 cup snow peas? All I see is 1/2 cup, 1/2 cup and 1/3rd cup respectively and it ends up being a scant handful that’s barely enough to serve one person, let alone be four servings. By the time I realized that more veggies were needed, I felt like it was too late to add them. I’m still enthusiastic about the recipe and will try to make it again but as it stands, I’m disappointed because I’m a very slow and cautious cook and this took me a lot longer than 30 minutes with very little food to show for it. I guess once I’ve had my mouthful of veggies that the coconut curry broth will still be nice with the coconut quinoa. That totally makes sense. Loved the curry last night. Thanks again! I cooked this recipe yesterday . I was sceptic at first but when I saw the final results I was so happy that I went on and on about it. I cannot believe how delicious it came out and how simple it was. I used sweet potato, cauliflower, frozen peas and courgette instead and put 400 ml of coconut milk with the sauce instead of 2 cans. I also put 2 tbsps of curry instead of 1 and added a pinch of cumin and cinnamon. It came out really creamy, tasty and filling. This is the second time that I used your recipes (the day before yesterday I made the sweet potato and black bean burgers and were awesome). I will definitely use your recipes again and am looking forward to try another new recipe of yours. Thanks . Eating it now! It’s very delicious with a few adjustments. 1. Make your own curry powder by grinding the spices in a coffee grinder, spice grinder or mortar and pestle. The flavor will pop if you also lightly toast the spices in a small saucepan before using in the recipe. 2. Add a tsp or two of fish sauce. 3. Add a tsp or two of natural or turbinado sugar. I removed the vegetables once they were tender-crisp, and let the sauce continue to simmer and thicken a bit. Once I added these things the flavor was much richer and more authentic. This is the type of meal you could pay good money for at a classy Thai restaurant! I love your website and today I had this delicious curry for dinner. Thanks to you I got my hubby into eating healthier. Wonderful! Glad you liked it, Silvana! I never leave reviews for recipes but this one was just so good I felt like I had to leave a comment to tell everyone they NEED to try it! It’s so quick and easy and oh so delicious :) I will definitely be making it again and look forward to the fun of trying out lots of different vegetable combinations! This was easy and lovely. I used broccoli, carrots, peanuts, potatoes, pea pods and pineapple. Thank you! Have to tell you a story about how good your curry is! We went to a vegan restaurant while visiting family. It was a great place and really nice food. My daughter got their curry and she kept talking about it wasn’t as good as yours. As soon as we got back from our trip, we made your curry right away! This time we made a lemongrass and curry leaf broth with carrots/onion/celery. Fantastic…thanks again! We discussed whether we should try out a different curry recipe from a different site because it is June and we are still only making your curry. Nope…didn’t happen – ha! We just knew this would be amazing…it never fails us! We haven’t tried the lite coconut milk yet because we have some full fat we need to use up first. Of course, will let you know;) Thanks for this awesome recipe! So funny! Glad you enjoy it so much. Thanks for sharing!! I’m pretty sure I’ve made this before and it turned out awesome. This time it seemed really thin. I ended up adding some full fat coconut milk (have never used before – it was great!! Like whipped cream) I think I’ve omitted the veg broth in the past. So that is what I will do next time. I also used different curry this time – never again will I go with the cheap stuff. I ended up adding a lot more. I also added a little sugar. I know I’ve made this before – it is really good but next time no veggie broth and I will use full fat coconut milk and maybe half a can of lite:-) for a thicker consistency. Now – the quinoa – holy cats I almost didn’t do it because I usually use rice. I don’t know if I can ever have quinoa again without coconut milk lol it was so good. I didn’t have agave so I did add a little sugar to this too. I steamed broccoli separately and roasted asparagus in the oven. You know what made it all come together? The LEMON. I layered quinoa, veggies and poured a little curry on top. Then I squeezed lemon over that. Yup that did it. Made up for my cheap curry! Thank you for this delicious recipe. I loved the way you explained everything, it was so easy to follow and your photos were what got me hooked. I made this the other night and my extra three unexpected visitors loved it. Gorgeous! I love cooking and don’t mind the complicated recipes, but this one is just perfect for a weeknight, it made my day. I used cauliflower, snow peas, capsicum, tomato as the main veg and stuck with onion, garlic, ginger for the spice base with chana masala and chili powder (that’s what I had at home) as the spices. Perfect! And thank you so much for the coconut quinoa idea, that was divine, an absolute keeper. This turned out awesome. I had a coconut curry at Thai restaurants several times and always wanted to know how to make it. I thought it would be so complex (and I’m sure there are more complicated versions of this). But for someone who is not a big cook (e.g. me) this is a perfect recipe. Thank you so much for sharing your knowledge! Loved this! Great flavors and veggies. We made no subs to it at all…which is unheard of for us:) Thanks!! Made it again…equally good the 2nd time around…thanks! We are addicted to this! Made it again and added more veg to what is already in recipe just to experiment – cauliflower, zucchini, and regular green peas. We used 1 1/2 cups broth to 2 cups coconut milk and thought this ratio was just right for us. Thanks again! Yay! Thanks for sharing, Thoma! I gave my toddler yellow curry at a restaurant recently & he thought it was so delicious he just about lost his mind. So, I found your site searching for a simple curry to make for him tonight. He loves quinoa as well, so I’m hoping this is a big hit! So good and easy. I didn’t believe it would be a 30-minute meal, but it was! Including the chopping! Great flavors and keeps well for leftovers, too. This is good enough to order from a takeout place, but now easily made at home by me!! Wow! I made this for dinner tonight! I thought it was going to be complex when I looked at the pics and the recipe list, but it was SUPER simple! I added cauliflower also. SO good. The aroma throughout the house is reason enought to make it, but wow the flavor. Creamy with a sweet & spicy tang! This one is a keeper!! TY! I used Coconut Milk like soy milk, rice milk or almond milk. I didn’t have the coconut cream stuff. Anyway, mine turned out ok, but pretty spicy, a little bit to spicy. I like curries alot, but I did not love this one. I am not sure I will even keep the left overs. The Quinoa with the Coconut Milk actually curdled the milk!? Which I thought was weird. It tastes fine though. I guess I didn’t have enough coconut in it, due to my not having cans in my pantry at the moment. My friend served me this yesterday, loved it so much will be making it again myself tomorrow, and I never worry about final results / re: some of the comments , (tasteless curry) !! !, if you are truly a cook, you always taste it at the end and re spice!!! Great Curry Dana! I made this the other night and it smelled so fantastic with the garlic, onions and ginger, so I was really thinking that it would be super tasty. It had no flavor. How can this be? I used the light coconut milk and I think it just totally watered it down. Has anyone tried it with full fat coconut milk? It looked beautiful, tho. Add more seasonings next time! I keep spices pretty conservative on the blog since the majority of people don’t like overly flavorful things. But just up the curry powder and salt next time! I cooked this for dinner last night, adding cinnamon to the sauce. Sooooo good! Delicious (as always!) my husband and I would like some recommendations on “spicing” up this curry with more of that Indian flavor. Thank you! I made this last night but with frozen peas/carrots/broccoli, but it was so refreshing an tasty! Instead of coconut quinoa, I substituted soba noodles (I’m new to asian pasta and trying to experiment), but next time I’ll do the quinoa definitely. Oh yum! Tonight I made the coconut curry in a snap. Lots of wonderful flavors. I used 2x the curry and probably 1 tsp of chili powder. I like more heat than sweet. Great! Thanks for sharing Amber!! This was honestly the most tasteless curry I ever had. These pictures look awesome but the flavout can’t compete. Loved this yellow curry! My husband and I tried for dinner. It was simple to make and so delicious. Total comfort food. We added sweet potato, tofu and a little turmeric. Not too spicy, just right and so healthy for our veggie / gfree / low carb diet. Thanks for sharing this wonderful recipe! We plan to serve it with homemade naan bread next time. Yum! Thank you thank you for sharing this curry recipe. It was a big hit and so easy to make. It hit the spot on a cold evening. I will be making this again. Yay! Thanks for sharing, Hannah! I just made this and it is one of my new favorite curry recipes!!! My English hubby loves it and he is a curry fanatic! I just tried this tonight, and it turned out great. I skipped the cayenne pepper to keep it mild for my son, so I think next time I’ll double the curry powder. Thanks for a great recipe! Great! Thanks for sharing, Lisa! My husband and I have just decided to switch to a Vegan lifestyle and this was the first meal that I made. It was absolutely delicious, and gave me confidence that we can do this! So kind! Glad you enjoyed it! My daughter made this recipe today – tantalizing aromas from the kitchen and a totally delicious dinner! We’re adding this one to the family menu because it went down so well – quick and healthy, what more could we ask for? Thank you! Sounds deceptively like the “Avial” from Kerala. You folks should try that too. It doesn’t use curry powder but green chillies. The quickest and healthiest accompaniment with steamed rice, loaded with vegetables. Looks great, looking forward to trying it. Just one clarifying question, it looks like the Nutrition Information includes the quinoa, is that correct? I loved this recipe!!! it was so delicious! I think i put the snap peas in a little too long but even so it was such a simple recipe to follow! Cant wait to get your book. Even though I had no curry powder, nor turmeric, this still turned out excellent! Great! Thanks for sharing Katie! Excellent. Made a few modifications, including adding chicken and 86 quinoa. It was delicious! Thank you! I made this, and we LOVED it!!! We already ate it all, I wish I would have photographed it, but we were starving and last night was a busy night, so I forgot. I’m in love with the site, and I’m planning on ‘my favorite vegan pizza’ for Saturday, I won’t forget the photo. Thanks so much for all the great recipes and being awesome. This was delicious. But I added chicken ;) and fat free chic stock ;)) and I added chili oil from the Asian food store to cook the chicken first then added all the stuff to it, gave it a great low heat. My husband said it was one of the best recipes we ever made. Thanks for the recipe! It may have been my curry powder, but the dish tasted slightly bitter and not as sweet as I had hoped. Still good, though! I might try a curry paste or different brand of curry powder next time. Also, I would add the broccoli a few minutes later so it’s greener and crisper. I cant wait to make this for dinner! I was wondering what do you think about adding chicken??? I know my husband will ask me where the protein is ;) thanks!!! I made this last night! It was really easy plus it was great to be able to use up the left-over veggies from making your one hour fall pot pies days before. I left out the tomato and snow peas but added some turnip, slivered sweet potato, shiitake mushrooms, kale and some fresh turmeric root. I seemed to only need one can of the coconut milk, if I added the other it would have been more like a soup–not that there’s anything wrong with that, but I didn’t want my rice to get lost underneath, especially since I finally didn’t ruin the rice as I usually do. Thanks for this one! My family enjoyed this last night! Even my daughter who seriously dislikes everything coconut. I’m finding that coconut curries are palatable, even enjoyable, to her. Thank you — so quick, easy, and tasty! I made this recipe tonight and it is absolutely amazing. I wanted to create a base sauce recipe for my restaurant that is vegan and gluten free friendly. I added thinly sliced chicken breast and increased the cayenne pepper to 1 tsp for a little more pop. This is a restaurant quality sauce and dish. Thank you so much for this amazing recipe. I’m actually eating it as I’m writing this. Just fantastic!!! Glad you liked it, Manon! Delicious! Such an easy and basic recipe. The recipe turns out exactly as written – fairly saucy and not spicy. It is easy to alter to one’s preference and definitely one I can imagine using over and over again. Thanks! It might sound like a silly question but what size cans of cocnut milk do you use? I made this! Outstanding, my family loved it. Made this for dinner tonight. I made it with brown rice instead of quinoa and I used curry paste instead of curry powder. (I doubled the amount of curry too because we like it loaded!) I also threw in some tofu. Excellent recipe, we will be making it again. Thank you for sharing. Made it just now and I’m a Curry virgin . YUMMMMMMMMMMMMMM. I doubled up the broccoli and omitted all the othere veggies except onion and garlic (i’m picky like that) but it was great ! Yay! Thanks for sharing! So glad you liked it. Do you think you could freeze this? Looks delicious! I froze this and it was just as lovely defrosted. I purposely undercooked my veg whilst I was making it, froze it in plastic containers and then reheated over the stove. By the time it was all warmed through the veg had cooked perfectly. I did find it was a little bit thinner after defrosting so I added a tbsp of cornflour and it was as good as if I’d made it fresh. Thank you for another awesome recipe. (First recipe I made from your site was the Almond meal cookies with chocolate chip and coconut. I <3 any recipe that contains coconut! Yes! That’s when I added it. Thanks Autumn! Hope you loved it! Can you add tofu to this? Looks YUM! Thanks Beka! Let us know if you give it a go! Thanks Richa! Just stalked your blog. IN MEGA LOVE. Lez be friends! The fact that you two vegan cooking divas stalked each other is everything! This is a yummy recipe, however the garlic and ginger are missing from the instructions! Becky, thanks so much for catching that! It’s been fixed. In editing the steps I must’ve removed them without noticing. Thanks again! Was AMAZING.. and so simple! Yay! So glad you enjoyed it, Jessica! I love everything about this recipe. Can’t wait to try it! Thanks, Brittany! Let me know if you do! I love these kinds of simple coconut curries. I have to admit that I usually add leftover roast chicken, but mostly for my husband’s benefit. 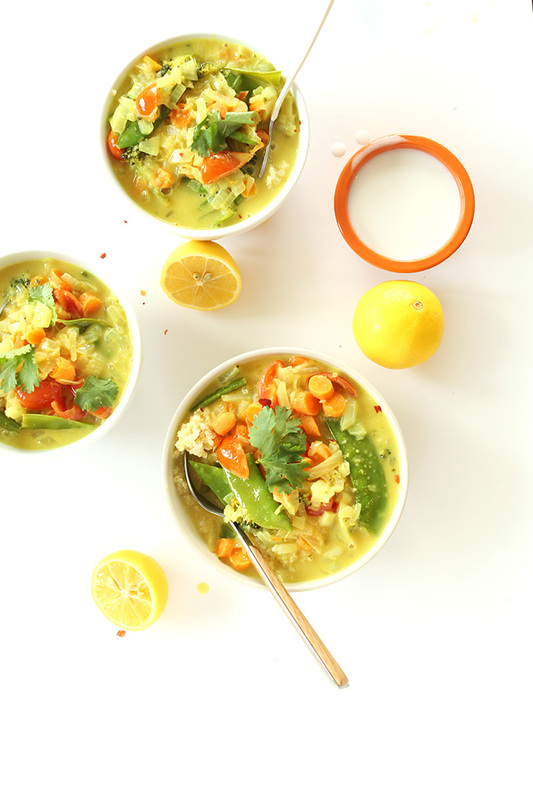 I could easily enjoy a bowl or two of this with lots of colourful veggies thrown in! Coconut curries are the best curries! Warming and comforting. This looks lovely, I’ll have to add it to my upcoming meal plan. I’m dying to go to India! Not only the food, but the culture, so in love! This curry + coconut, HECK TO THE YES. Coconut quinoa sounds divine! We make a lot of curry and have no idea if it’s authentic or not. We looooove it though, and I’m sure we’ll love this recipe too! Right? I so want to go to India to have authentic curry and experience the culture, which I’ve heard is like nothing else. But until then, I’m satisfied with this version! I am from India and there is absolutely no single definition of curry…. it differs state to state entirely, from region to region within the states and from household to household… and on the other hand, commercial kitchen differs greatly from household kitchen… I hope you get a chance to visit India and just experience the Sheer variety :) .. I love curry! I know you live in KC, have you been to Swagat Indian Cuisine in Zona Rosa? It’s worth a try! Ah! Good tip! I’m only been to Korma Sutra in Westport, but thought it was really good. I’ll have to add that to my list! What a beautiful, fresh-looking curry! I love that curries are such a great comfort food, but also so fresh and healthy that they actually make you feel good after you eat them! I love a good curry. Thanks for the keeper recipe, especially the coconut quinoa idea. Quinoa + coconut = dreamy. Hope you enjoy, Jane! hi- this is slightly unlrelated to this blog but it has to do with your other blog go miles, go! I would really love to access the website but even after comfirming my email I cant get into the website. can you help?? i would love your help with figuring out free miles. thank you for putting it together! I love a good curry, and this one looks so fresh and beautiful! Good ol’ Wes has me really wanting to go to India too!! Wes has a way of doing that to us, eh? I want to get to the site of every movie he films! Can’t wait to see Budapest Hotel. I love Wes Anderson myself, but he certainly romanticized India. I have spent over a year there and can say that he glossed over some of the grittier experiences most people have when visiting. SMART lady! I’ve tried a sweet potato curry soup but am sure the peanut butter would be an amazing addition. Thanks for the tip! There is almost nothing better than coconut + curry. And it’s so pretty, too. Agreed! Every once in a while I just crave coconut curry. This one does the trick! As far as I am concerned, nothing beats a good curry. Seriously, I’m addicted to curry. I eat it at least once a week (or thrice). Yours look amazing! And that COCONUT QUINOAAAAAAAAA. Coconut+curry is one of my favorite flavor combinations. I love how this is really saucy. I would definitely love this with some brown rice. Extra saucy is a must in this house! I like my rice or quinoa to be saturated. Glad you agree! I figured I had misinterpreted that! Thank you. I don’t know if this has been addressed in the rest of the comments but the instructions do say 2 cans of coconut milk in the curry and 1 can in the quinoa. So that’s a total of 3 cans. You mention here 1 can of coconut milk in the curry and 1 in the quinoa but below you mention 2 for the curry and 1 in the quinoa..? Crap. I just put two cans of coconut milk in the soup. Even so, it turned out great! I used 2 cans of full fat coconut milk in the curry and 1 can of light coconut milk in the quinoa. It turned out amazing! I’d imagine I’d be wanting more sauce if I only used 1 can of coconut milk in the curry.